Global Governance Watch (GGW) was founded in 2008 as a joint initiative of two influential right-wing groups, the neoconservative American Enterprise Institute (AEI) and the Federalist Society. GGW claims “to raise awareness about global governance trends and developments, to monitor how the work of transnational organizations influences domestic policies and outcomes, and to address issues of transparency and accountability within the United Nations, related intergovernmental organizations, and other non-state actors.” As of 2015, it appears that GGW is no longer affiliated with the American Enterprise Institute, with its website only mentioning that it is a project of the Federalist Society. A key GGW activity appears to be posting links to articles that detail the activities of various international groups. GGW often editorializes the titles it chooses to link to these stories. For instance, an April 2015 article from Foreign Policy cited on the “global political Islam” section of GGW’s website featured the headline on GGW’s website, “Violent Islamist Threat Spawns Intense Debate in Canada about Intel and Security Reform.” Each of GGW’s four “sections” also hosts an array of documents from these international groups, such as their charters, conventions, and declarations on various issues. An AEI press release about GGW's April 2008 inauguration event declared: "The proliferation of international policymaking organizations has intensified and institutionalized the influence of global governance. Suprastate and nonstate actors, such as the United Nations (UN), NGOs, and international financial institutions, have risen in prominence and power, bringing with them internationalist agendas that are challenging the abilities of nation states to determine their own domestic policies and priorities." Maintaining U.S. sovereignty was likely a primary concern for most of the inaugural event's speakers and panelists, many of whom are known for their militarist views regarding U.S. foreign policy, such as Danielle Pletka of AEI, former U.S. Ambassador to the UN John Bolton, and Claudia Rosett of the neoconservative advocacy group Foundation for Defense of Democracies. During his keynote address at the GGW launch, Bolton "pointed out that some people try to use the expanding scope of global governance to sidestep the U.S. Constitution, saying that people 'who are dissatisfied with political outcomes they have achieved at the state and federal level' take their arguments to international forums to constrain the United States. But Bolton warned that sharing sovereignty could mean undermining constitutional prerogatives. 'To Americans, sovereignty is not some abstract concept,' Bolton said. 'For us, in this country, we are sovereign. We govern.' He cautioned that 'by talking about breaking sovereignty down or sharing it or limiting it, people are saying to us that we do not know how to govern ourselves effectively and that a little less self-government would be good for us.' Bolton said he thought 'the vast majority of Americans [would] disagree' with this sentiment." GGW’s predecessor program, NGOWatch, was founded in 2003 by AEI and the Federalist Society with the purported aim of "highlighting issues of transparency and accountability in the operations of nongovernmental organizations and international organizations." It was intended to serve as a monitoring tool for policymakers, media, and the public that would capture "the complexity of the fast evolving world of NGOs and the multiplicity of issues at stake in an effort to bring accountability to the NGO sector." The program was replaced with Global Governance Watch in 2008. While presenting itself in neutral terms as a project aimed at improving transparency at NGOs, a sector of society it termed a "time-honored tradition in the United States and throughout the world," NGOWatch spurred considerable criticism. Some observers viewed it as a staunchly conservative effort to check the supposed influence of "liberal" NGOs. Jean Hardisty and Elizabeth Furdon of Political Research Associates reported in 2004: "NGOWatch is a clear example of a right-wing campaign designed to monitor and critique 'liberal' UN-designated NGOs…. NGOWatch attacks those NGOs that organize and mobilize public opinion and advocate for 'liberal' causes." In response to criticism from liberal-leaning commentators like Ralph Nader, who charged that the project was a politically motivated effort to "go after liberal or progressive NGOs," and Naomi Klein, who called it a "McCarthyite blacklist," AEI's Danielle Pletka told the New York Times: "They should take a pill. It is in all of our interests to have NGOs, even NGOs we agree with, be accountable, and transparent, and have a role in international institutions that is clear to everybody." Before it began directing web surfers to the GGW website in 2008, the NGOWatch website provided brief organizational dossiers of hundreds of NGOs from around the world, as well as of international organizations like the United Nations, NATO, and the International Monetary Fund. As of 2015, GGW provides many of these same documents on the NGO Watch section of its website. One section of the NGOWatch website was devoted to "Corporate/NGO Relations." The top of this page read: "Corporations who have resisted NGO campaigns have met with devastating consequences. Many corporations now work to pre-empt NGO activism with aggressive Corporate Social Responsibility efforts and broad engagement and support for NGOs. Do corporations see this dialogue as a necessary price to pay to protect its brand from attacks? Are there best practices in the way corporations enter into dialogue with NGOs? Are corporate-NGO relations transparent to the shareholder or of benefit to the public?" The page provided links to half a dozen media articles and academic papers discussing these questions, including an August 2003 Economist article titled "Living with the Enemy," which described the often bitter relations between NGOs and corporations, as well as the dangers companies face in trying to engage NGOs. The article concluded: "Helpfully, in June  the American Enterprise Institute set up a website called NGOWatch with the Federalist Society for Law and Public Policy Studies to bring clarity and accountability to the burgeoning world of NGOs." NGOWatch held several conferences and published "white papers" highlighting what it saw as problematic aspects of NGO culture and hot-button issues in the advocacy world, like corporate social responsibility, intellectual property rights, and the growing reliance by government aid agencies on NGOs to help implement and develop programs. The website also provided daily updates on events sponsored by international organizations or NGOs. In late January 2007, for example, Leonard Leo, vice president of the Federalist Society, wrote "daily reports" for NGOWatch on the World Health Organization (WHO) Executive Board session in Geneva, Switzerland. The website offered few details about its directors and employees, although it did provide a "list of experts," which included scholars and leaders from various organizations, private firms, and universities, including Roger Bates and Steven Hayward of AEI; Michael Edwards, director of the Ford Foundation's Governance and Civil Society Unit; Harvard University professor John Ruggie; Gerald Steinberg, a professor of political studies at Bar Ilan University; and P.J. Simmons, an adviser at the Rockefeller Brothers Fund. One listed expert, Jeremy Rabkin, described by commentator Jim Lobe as "one of the most prolific NGO-bashers," attended the 2003 AEI conference marking the launch of NGOWatch. Rabkin said at the conference, in perhaps what was a harbinger of the organization's evolution: "'Global Governance' … sums up what at least the advocacy organizations think they are doing. Once you say 'global,' of course, you are appealing to people who have very cosmopolitan views and you're not appealing to people who say, 'No, wait, we in our country want to just do what we do in our country.' If it is global, it is anti-national." American Enterprise Institute, “Jon Entine,” https://www.aei.org/scholar/jon-entine/. Global Governance Watch, “About Global Governance Watch,” http://www.globalgovernancewatch.org/about. René Urueña, “No Citizens Here: Global Subjects and Participation in International Law,” 2012, https://books.google.com/books?id=HRo74Ux8kzoC&pg=PA48&lpg=PA48&dq=%22Global+Governance+Watch%22+american+enterprise+institute&source=bl&ots=iAPBwAJEtx&sig=ssCStBZZ4ndbtBTW6VKmcfVlW5M&hl=en&sa=X&ei=Gmk-Vctq1NuwBJ_cgNAL&ved=0CEgQ6AEwBw#v=onepage&q=%22Global%20Governance%20Watch%22%20american%20enterprise%20institute&f=false(p48). Global Governance Watch, “About Global Governance Watch,” http://www.globalgovernancewatch.org/about/. Global Governance Watch, “Global Political Islam,” http://www.globalgovernancewatch.org/global_political_islam/. Global Governance Watch, “Documents,” http://www.globalgovernancewatch.org/international_organizations/Documents. American Enterprise Institute, "Dictating Norms: Who Decides What Is Right for the World? The Inauguration of Global Governance Watch," April 14, 2008, http://www.fed-soc.org/events/detail/dictating-norms-who-decides-whats-right-for-the-world. AEI Newsletter, "Keeping an Eye on National Sovereignty," June 3, 2008, http://www.aei.org/publication/keeping-an-eye-on-national-sovereignty/. Global Governance Watch, “NGO Watch,” http://www.globalgovernancewatch.org/international_organizations/filter/ngo-watch. Jean Hardisty and Elizabeth Furdon, "Policing Civil Society: NGO Watch," Public Eye, Political Research Associates, Spring 2004, http://www.publiceye.org/magazine/v18n1/hardisty_ngo.html. Jon Christensen, "Asking the Do-Gooders to Prove They Do Good," New York Times, January 3, 2004,http://www.nytimes.com/2004/01/03/arts/asking-the-do-gooders-to-prove-they-do-good.html. 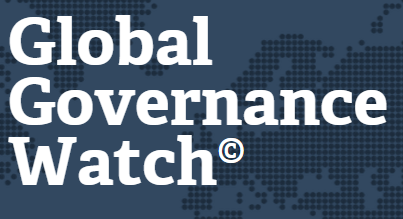 Global Governance Watch, “NGO Watch,” http://www.globalgovernancewatch.org/international_organizations/Documents. "Living with the Enemy," Economist, August 7, 2003, http://www.economist.com/node/1975902. Jim Lobe, "Right-Wing Hostility to NGOs Glimpsed in Amnesty Flap," Inter Press Service, June 4, 2005,http://www.ipsnews.net/2005/06/politics-us-right-wing-hostility-to-ngos-glimpsed-in-amnesty-flap/.